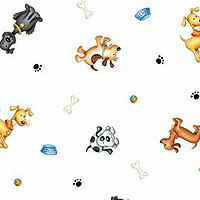 Doggie Days 5" x 11" Cellophane Bags. 100 bags per pkg. Bag background is clear. These bags have triangular sides (gusseted) so they will expand to hold more contents. These cute cello bags are food safe gift bags for goodies or other items.